CharityStars.com are currently running a set of auctions under the festive title of "12 Drummers Drumming" - a reference to the famous "12 Days of Christmas" song. The auctions are to raise much needed funds for the wonderful Teenage Cancer Trust charity, and offers a range of drums, drum heads and sticks from a range of artists. These include Nick Mason, Zak Starkey (son of Ringo, and The Who's drummer), Dave Grohl, and Nicko McBrain. 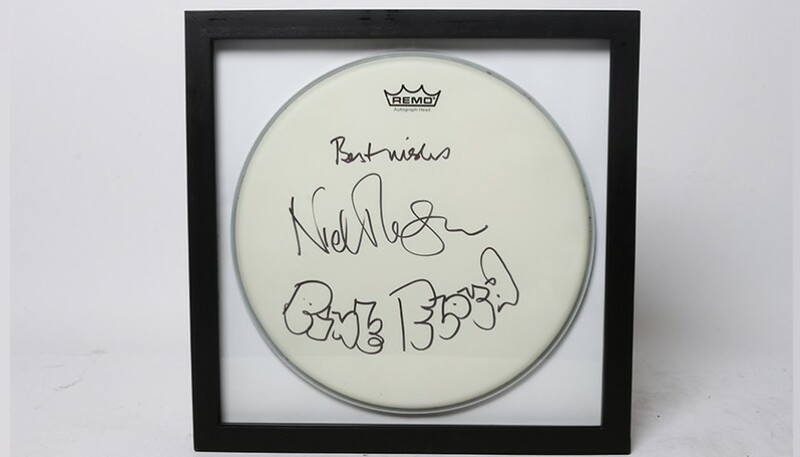 Nick Mason's offering, which can be seen here (click the thumbnail), is a framed drum head with the classic Pink Floyd "bubble" writing included in Nick's dedication. The auction for this ends on December 13th 2017, at 4:00pm GMT. The charity to benefit from the twelve percussive donations is a truly worthwhile one - they strive to make the lives of young people (children, teenagers and young adults) suffering with cancer a little better, with dedicated wards, decorated and equipped with things to engage and take the minds off treatments and suffering. Visit the Teenage Cancer Trust charity website for more information and to support them via donations, or purchasing items such as their music related goodies including David Gilmour concert posters/t-shirts.